The Reason I Love to Go Out! I mentioned this in class this week and last night once again I discovered it was true. The reason I like to go out is not only to have a break from cooking and just relax, but also because I discover new foods and new ways to prepare foods. G and I both had a long hard week and wanted to just relax and have some dinner at one of our favorite Portland restaurants – Fore Street. We have become regulars over our years here and whether we eat in the dining room with the family or perch at the bar for an intimate cozy adult evening – the food never fails us and the servers always take good care of us. Because we like taste treats, we frequently share a few things and accompany them with wine tasting treats provided by our favorite sommelier. The winners last night were the fall tasting platter, the Jonah crab and squash soup and the creme brulee with a ginger cookie. The tasting platter had black trumpet mushrooms with toasted pine nuts, roasted spicy and sweet tiny carrots on a bed of arugula, a dense wild mushroom (the name of which I now forget), sautéed chanterelles and a wonderful pickled slaw made of kohlrabi. 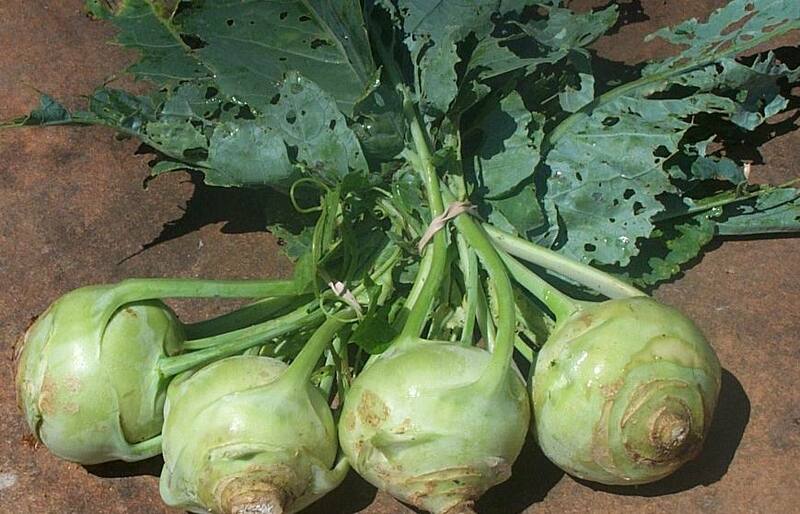 Now I must admit I have never eaten kohlrabi before, but have always been intrigued by it. It was crunchy, flavorful and wonder. 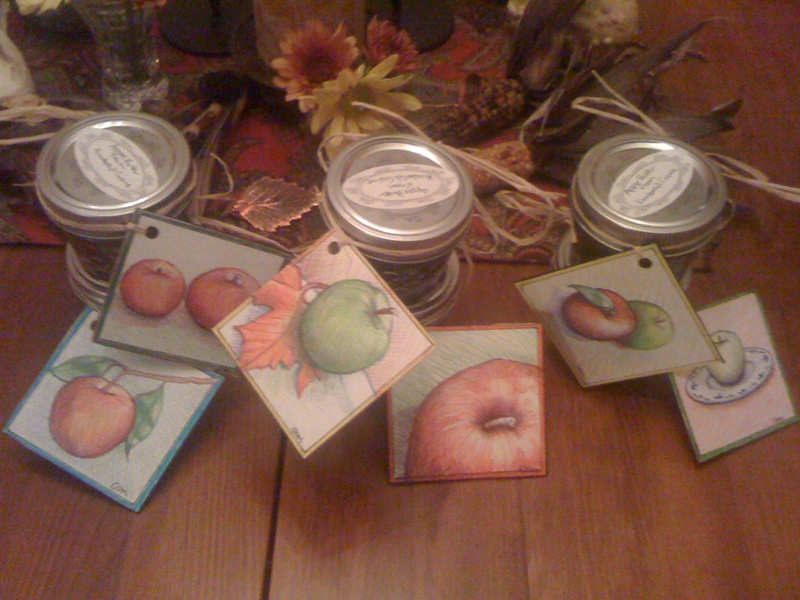 So today at the farmers market we bought some to experiment with. I will let you know how it goes. Kohlrabi came to the United States from Europe. It’s name literally means cabbage-turnip. It comes in white, actually green, and purple varieties. The beauty of the crab and squash soup is that is was rich and smooth and the bits of Jonah crab simply melted into it and provide a bit of texture and a delicately salty flavor to the sweet squash. To top off our luxurious tasting menu – we splurged with a creme brulee – perfectly torched and a dense, not to sweet old fashioned ginger cookie sprinkled with powdered sugar. 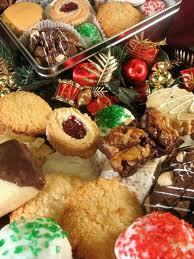 What could prove more delightful to your taste buds as we begin the march to the holidays? In a medium bowl, mix the sugar, cinnamon cloves and salt. Pour the mixture over the apples and mix well. Reduce the heat to low and cook 9 to 11 hours, stirring occasionally until the mixture is thickened and dark brown. Uncover and continue to cook on low 1 hour. Stir with a whisk, if desired, to increase smoothness. Spoon the mixture into sterile containers. Cover and refrigerate or freeze. The guys like this one as it is a bit meaty and both savory and sweet. Good for a game day Sunday. In a large skillet, melt butter over medium high heat. Add onion and sauté, stirring constantly, until onion is golden. Stir in apple jelly and brown sugar. Add sausages and reduce heat to medium-low. Cook and stir occasionally, 20 minutes or until mixture begins to thicken. Add apples, partially cover pan and cook about 10 minutes more or until apples are tender. Combine cornstarch and water and stir into mixture in pan to thicken. Cook 2-3 minutes more until thickened. Serve warm with toothpicks and a small plate or napkins. This is a quick appetizer to throw together for a last minute party. You can even slice the bread the day before, prepare the walnut mixture and prep the cheese. Then toast the bread and slice the apples before the final assembly before the party! Preheat oven to 350 degrees. Toast bread until slices turn golden. Center should be slightly soft still and crusts brown. Remove rind from cheese and discard. 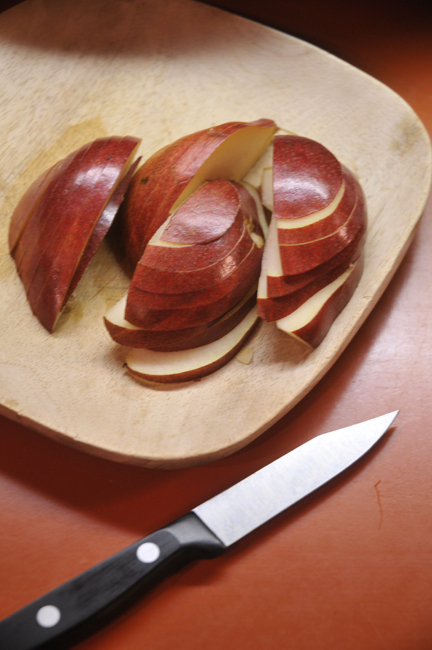 Wash and slice apples into ¼ inch slices. Place cooking sheet in oven until cheese melts. Be sure to watch cheese so it doesn’t over cook. If you cannot find blanched hazelnuts with the skins already removed. If not, you can prepare them yourself at home. Preheat oven to 375 degrees. Place the nuts on a baking sheet with sides or in a small pan. Toast until the peels crack and the nuts are fragrant, 10-12 minutes. Turn the nuts out onto a dish towel. Briskly and with some force, roll them around in the towel, scrunching them with your fingers to loosen the skins. You may not be able to get all of the skins off but that is all right. Chopping hazelnuts can be a bit tricky because they are round. But do not use a food processor, as it will reduce some of the nuts to dust and render them useless. To chop, layout a few nuts at a time and hit them with the flat side of a cleaver or a small frying pan. After you hit them – they will be broken into more easily chop-able pieces. At this point you may not need to chop them – you do not want the bits to be too small or they will be difficult to pick up with a fork. Toss the hazelnuts with a little bit of the dressing to coat. You may leave the endive whole, if you plan to serve the salad with a knife and fork or you may cut them crosswise into fork sized slices. Toss the leaves with most of the rest of the vinaigrette and divide amongst 4 salad plates. Top with the apples slices and drizzle with a bit more of the vinaigrette. Sprinkle with the nuts and garnish with the cheese shavings if you like. Turn the heat off and stir in the butter, Parmesan, gorgonzola, goat cheese, chopped apple and marjoram. Check the seasoning and add salt and fresh ground pepper id desired. 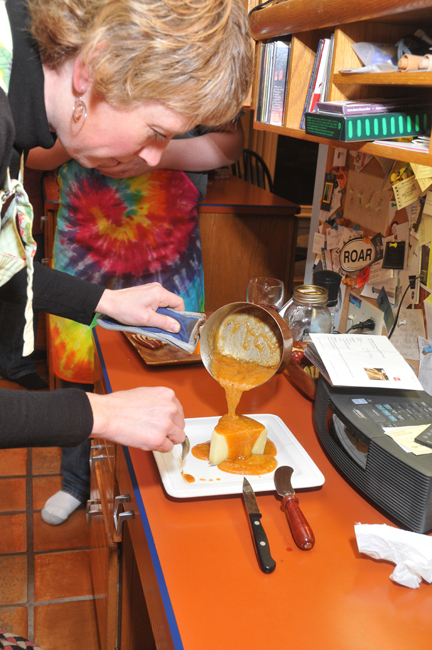 Put a lid on the and leave the risotto to rest for a minute so the cheese can really ooze into it. While you are waiting – gently heat the walnuts in a pan. You can either divide among plates and drizzle with a little extra olive oil and sprinkle with nuts or leave in a large dish and do the same. Bring extra parmesan to the table for grating or sprinkling! In the bowl of a mixer with a paddle blade, combine the flour, 1 teaspoon of the sugar and the salt. Add the butter and mix at low speed until it is the size of peas, about 30 seconds. When the machine is running add ¼ cup ice water. Add only as much of the remaining ice water as is needed until the dough is just moistened, 1 tablespoon at a time. Turn the dough onto a work surface and knead quickly until the dough all comes together. Pat the dough into a disk and wrap in plastic wrap and refrigerate one hour or overnight. Preheat the oven to 400 degrees. Line a large baking sheet with parchment paper. On a lightly floured work surface, roll out the dough into a 17 inch circle and trim to 16 inches. Transfer the dough to the cookie sheet. In a large bowl, combine the remaining ½ cup sugar with the lemon zest and a pinch of salt. Add the apples and lemon juice and toss well. Arrange the apples on the dough in two concentric circles, leaving a 3-inch border all around. Fold the edges of the dough up and over the apples, overlapping the dough on itself as needed. Brush the rim with egg white and sprinkle with the turbinado sugar. Bake the pie in the center of the oven until the crust is golden and firm and the apples are tender – about 55 minutes. Transfer the cookie sheet to a rack to cool. 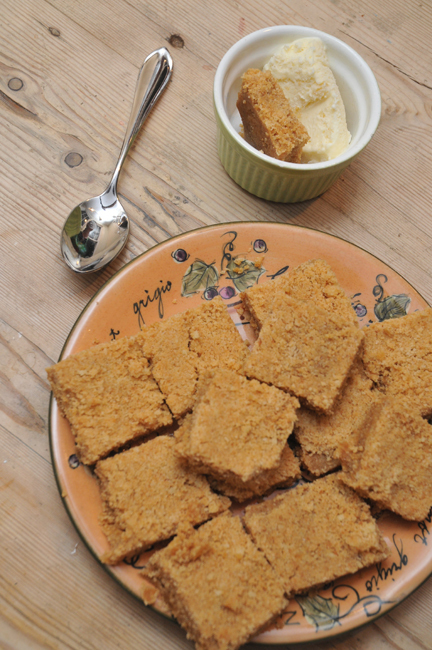 Slice into wedges and serve with a dollop of crème fraiche, whipped or ice cream. If you like, the dough can be prepared a day ahead and refrigerated.